at your home or business! 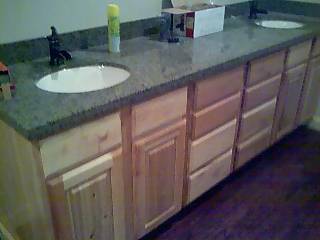 Wood-N-Thingz offers many choices for countertops. Solid wood, designed cement, formica, and solid surface. Wood-N-Thingz is a licensed distributor for Livingstone Surfaces solid surface. Solid surface countertop with decorative tile. Solid surface countertop with decorative glass tile.